Stipple engraving has for the most part disappeared as an art form. It was popular in the 1700’s as an art form in itself but had been used with line engraving since the 1500’s. Stipple engraving is a technique which distributes dots of various sizes and densities across the image. The pattern is created on the printing plate either by gouging out the dots, or through an etching process (gouging out of the resin ground on the metal plate which then allows the acid to bite the metal when dipped in the acid bath). I have only a few true stipple engravings in my collection. I have some etchings which use stipple to create the subtle tonal variations required. Both of the artworks which I am talking about today are unsigned and undated. If one looks closely at a stipple engraving one can see the dots which make up the picture; unlike today’s modern reproductions which may require a jewellers lens to see the pattern. Although the image is made up of dot there is not really a pattern per se. To intensify colour the dots are placed closer together and separated more for lighter shading. 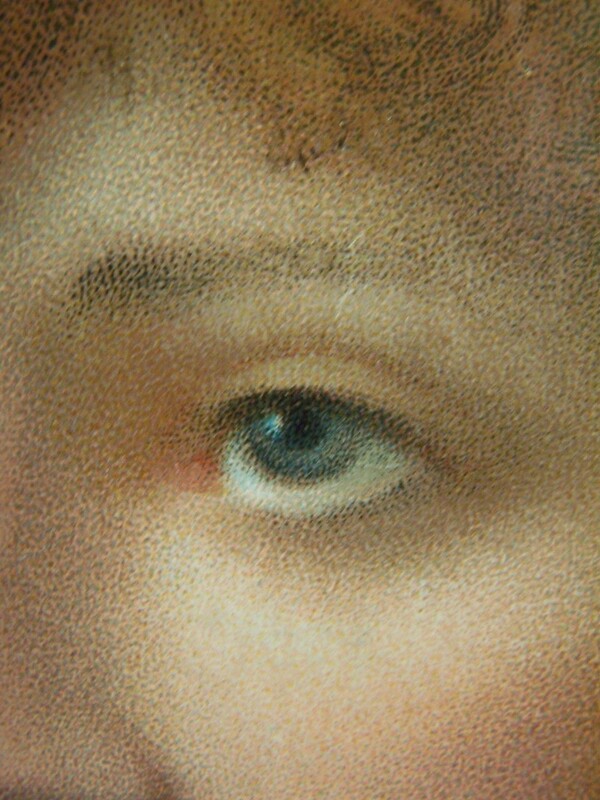 I show a close up of this young ladies eye to enable you to see the dots which make up the image. The use of dots without any engraved lines gives one a very soft and just off focus feel to the image. The meticulous placing of dots to enhance colouring was a very labour intensive job. The different colours were carefully applied with a brush to a single plate for each impression, a highly skilled operation which quickly proved economically prohibitive. 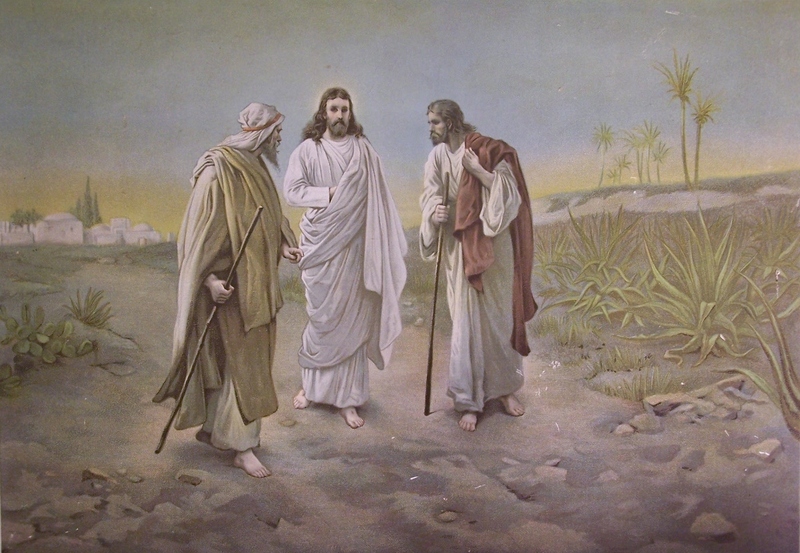 The next stipple engraving I have is a religious image of Christ walking and talking with two men on the road to Emmaus. Once again there are few etched lines so the image although clear has a soft focus to it. 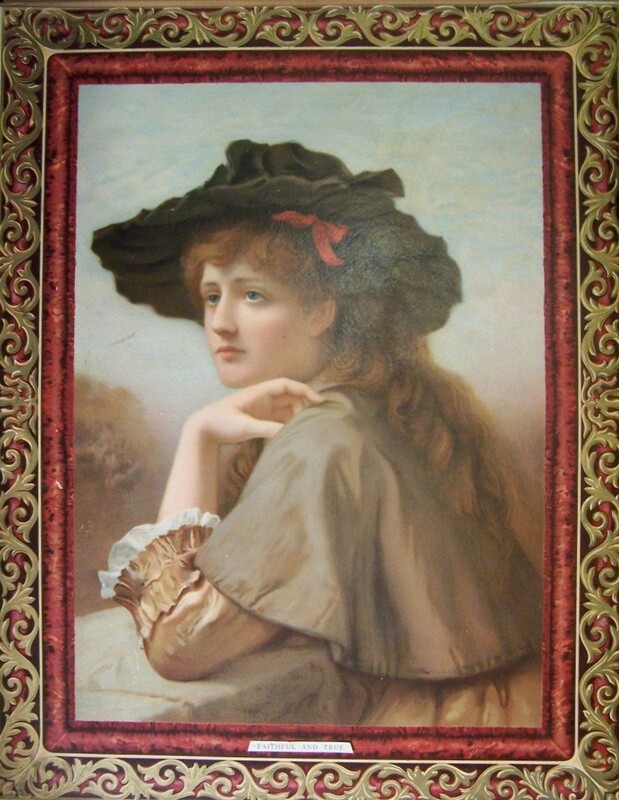 Once again unsigned but but is in the style of William Henry Bartlett (1809 – 1854). Both images have their own decorative borders (lower picture’s border not shown) allowing one to get a more modest frame and still have them look good when hung. I hope you enjoy them as much as I. The workmanship and patience which has gone into these pieces is immense. This entry was posted in Etching and tagged aloe, cactus, desert, girl in a hat, Jesus Christ, palm tree, red hair, ribbon, road to Emmaus, robes, scars, shawl. Bookmark the permalink.